Jeopardy Contestants are MUCH smarter than we are. They know detailed stuff about history and the bible and current event and geography and politics and we mostly write about the latest Jenelle Evans scandals every day. It's a living, you know? But, again, it's worth mentioning: Jeopardy Contestants are MUCH smarter than we are. That said, we know more about football than at least three people who qualified for this beloved game show, all of whom were forced to answer questions about this sport during a Double Jeopardy round because all other categories had been exhausted. Fewer points were scored during this segment of the show than during a typical Buffalo Bills game. The first question, for $200: Your choice: Do or don't name this place in which the QB runs the ball & can choose to pitch it to another back. For $200, considering how little most Jeopardy contestants know about sports, this was actually a difficult question. And, true to form, no one came up with the answer of the option. Nope, no one answers The Dallas Cowboys. "I can tell you guys are big football fans," Alex Trebek said/taunted at one point. “Do you think we should go to commercial?” the host later asked/taunted even harder. After the next two questions did not elicit positive answers, Trebek took the unprecedented step of asking to see the $1,000 question... just for the fun of it! "If you guys ring in and get this one, I will die," the emcee remarked, prior to a clue being given about the formidable Minnesota Vikings defensive line of the 1970s. 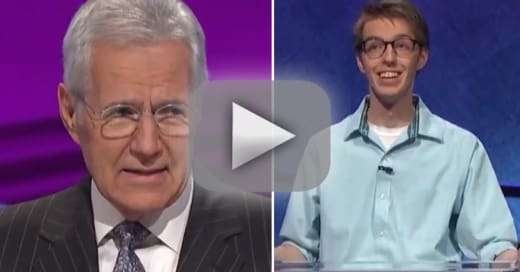 Did anyone shock Trebek by actually coming up with the proper response?